Leonardo Da Vinci’s ‘Divine Proportions’? early 1978 | age 9 More figure drawing tips for beginners! That’s right, would be students of art: pay close attention to this page, if you have your hearts set on drawing the human figure like a beginner. 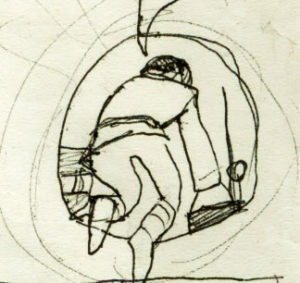 Crawling along a tunnel isn’t mentioned in the Marvel comic or the novelisation (it mentions a tube), so I must have drawn a version of what I actually remembered from the film. Cor… here they come, though! 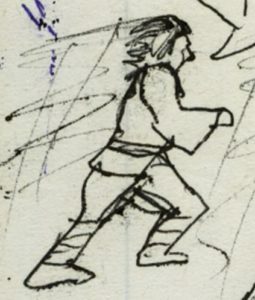 Han and Luke run toward one of the the Millennium Falcon’s staircases. That’s a very low railing, though. Do you think when Lando Calrissian owned it, it was crewed by Ugnauts? Here, I have another important question: can anybody enlighten me as to the interior layout of Solo’s ship? 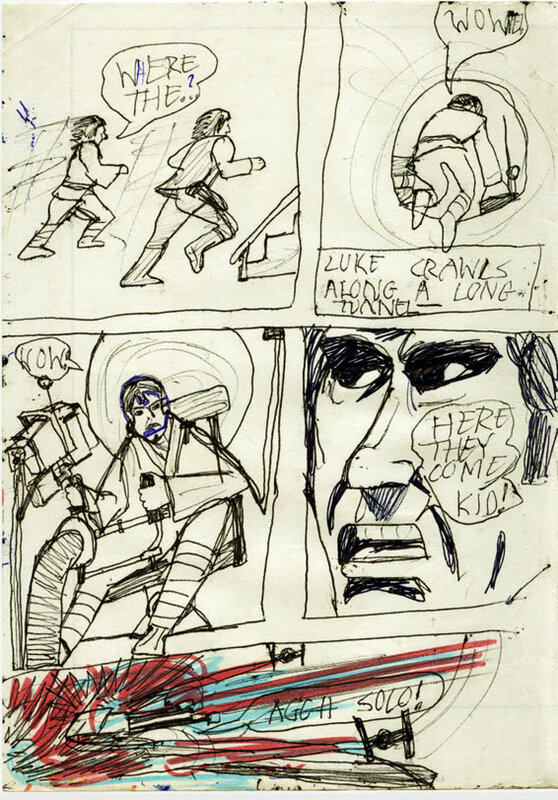 In my version, Luke crawls through a sort of tunnel and sits with his back to it. Here it is in the trading card, above. In the film, they climb up and down a vertical tube. But when Solo shouts over his shoulder “Don’t get cocky!” at Luke in the film—Luke seems to be at the other end of that tunnel—on the other side of the freighter. And, we see their guns over their heads. I’m confused! Is it just that there’s no up or down in space?—and that the ship’s artificial gravity can be flipped depending on what part of the ship you’re in? You can see why I wasn’t quite sure where the guns were located. Hmm. Maybe I should just stop caring about this. Oh, yes—the music in this scene. Wonderful. the opening phrases are delicate and sparkling, and my-oh-my, how the suspense builds! It almost reminds me of the great modern American composer John Adams’ “The Chairman Dances” or his “Short Ride in a Fast Machine”. Funnily enough, during the improbable night-time speeder chase in ‘Attack of the Clones’, John Williams is clearly borrowing from Adams. Though he wouldn’t have been doing so back in 1977, because Adams probably wasn’t even an orchestral composer then, but was a young man still playing in Jazz bands. I wonder if George was using Adams’ music as a temp track during the editing? It’s not unlikely. ‘Short Ride in a Fast Machine’ was only a few yeas ago the most frequently performed piece of modern American orchestral music. TIE Fighters blast the bloomin’ crap out of Luke’s Millennium Falcon ‘Quad Cannon’! Did you enjoy humming this one to yourself when you were a kid? Seth McFarlane certainly did—and does—during Family Guy‘s brilliant parody of this scene. I myself, still remember, at only 10 years old, walking back to my house across the big field, on a Sunday evening, the sun setting… the weekend drawing to a close, after playing soldiers or Star Wars with John S. all day long in the fields and woods—and humming ‘Ben’s Death and TIE Fighter Attack’ from the soundtrack album. Amazed at myself that I seemed to have the whole London Symphony orchestra in my head and at my command! So you don’t think the Falcon’s layout makes sense either? Good. Yes, now I can suspend belief also. And to take it to ridiculous extremes: seismic charges. Or was it sonic? I swear George cheekily did that to thumb his nose at science – for a laugh. Just felt like being the schoolyard prick for a minute. And as for the seismic charges, I read that Ben had originally wanted to use a sound like that back in ’75-’76 for the TIE explosions, but nobody bought it. He finally got to use the noise (to fantastic, pant-shaking effect) in AOTC. I went to see it in its limited IMAX release, and my pants are still shaking.